Howlin' Wolf Records: SIX STRINGS: A Howlin' Wolf Records "Exclusive" announcement from Director Ulli Lommel's Project! A Howlin' Wolf Records "Exclusive" announcement from Director Ulli Lommel's Project! 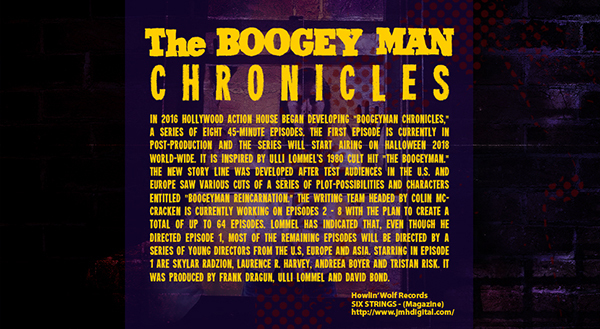 In 2016 Hollywood Action House began developing "Boogeyman Chronicles," a series of eight 45-minute episodes. The first episode is currently in post-production and the series will start airing on Halloween 2018 world-wide. It is inspired by Ulli Lommel's 1980 cult hit "The Boogeyman." The new story line was developed after test audiences in the U.S. and Europe saw various cuts of a series of plot-possibilities and characters entitled "Boogeyman Reincarnation." The writing team headed by Colin McCracken is currently working on episodes 2 - 8 with the plan to create a total of up to 64 episodes. Lommel has indicated that, even though he directed episode 1, most of the remaining episodes will be directed by a series of young directors from the U.S, Europe and Asia. Starring in episode 1 are Skylar Radzion, Laurence R. Harvey, Andreea Boyer and Tristan Risk. It was produced by Frank Dragun, Ulli Lommel and David Bond. DOCTOR STRANGE is Magically Delicious!